How cool was Daniel Craig in Layer Cake? As cool as that other guy, Jason Statham, in Lock, Stock and Two Smoking Barrels (and by the way: when it's time to finally make a Doc Savage movie the right way, they better get Statham), the two of them instant old hands, neo-Rat Pack-ers to the core. Statham, though, was more of a jack-in-the-box than Craig, and more working-class—and he's never lost that almost-light touch, bounding around and double-flipping his way out of kinetic scrapes. 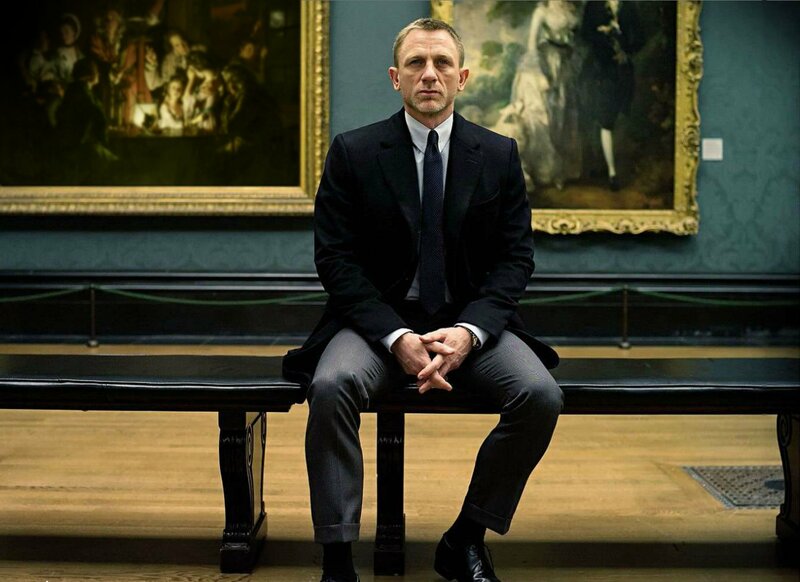 Daniel Craig seemed to settle down, hold it in—and so he made perfect sense as James Bond—twice, for sure, Quantum of Solace not the disappointment some decided it had to be—maybe only because Craig seemed confident that he could just keep being the best Bond since Connery. Fortunately, the guys who spend the money didn't listen to the Quantum of Solace complainers—or maybe they did: Skyfall manages to be both old-school Bond and Dark Knight-ish moody. Sam Mendes directs with a nice bifurcation: when things aren't dizzy and careening they're painterly and balanced—Jim Emerson in his blog Scanners points out how symmetrical the framing often is—and it's one of the best things about the movie, the almost comic-book-ish centering of the hero in the frame while around him lights and patterns and golden splashes fly. —And one more bifurcation: of Bond himself, in his evil double, Javier Bardem's Silva. Sure, Bond villains always have more fun than Bond, but Bardem bears down on Bond with those wild eyes of his—and he sees himself in Bond, and makes Bond see himself in Silva. Between the two of them, the movie reaches further than pop pulp and reassures me that all those Bond films are not, in the end, simply too many Bond films. As long as Craig keeps his gaze level and his mouth shut, he'll gives us a Bond that knows his duty and just keeps working—as he does in the novels, a little bemused, but solid. I agree this film was important for the whole Bond franchise, if it had continued like it was going, even if they kept making solid films, the whole franchise would have just became irrelevant. I'm so glad Sam Mendes is returning for the next one too. Oh and you mention Jim Emerson, you know what happened to him? I used to read everything the guy did but it's like he just disappeared off the face of the earth. The remake of Casino Royale reminded me of the books, which is nice; and I actually liked Quantum of Solace, but I understand some of the complaints.